MC Series chrome-plated brass couplings are built tough and made to last in the most demanding applications. 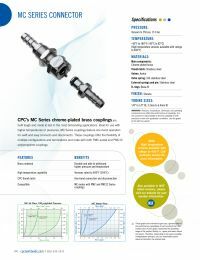 Ideal for use with higher temperatures or pressures, MC Series couplings feature one-hand operation for swift and easy connects and disconnects. MC NSF parts are listed under the criteria of the NSF/ANSI Standards.